This Slow Cooker Salsa Verde Corn Dip Cream is quite possibly the easiest appetizer ever created. There’s a reason why this dip disappears so quickly! Original content posted December 2013. Updated January 2019. Looking for an easy appetizer or snack idea? My Slow Cooker Salsa Verde Corn Dip fits the bill and is sure to please! Low maintenance and able to be made ahead of time, you simply can’t ask more of this delicious dip! Cream cheese, salsa verde, onion and spices are added to the slow cooker to melt together. Two and a half hours later, Monterey Jack cheese, cherry tomatoes and cilantro are stirred in to create this crowd pleasing dip. 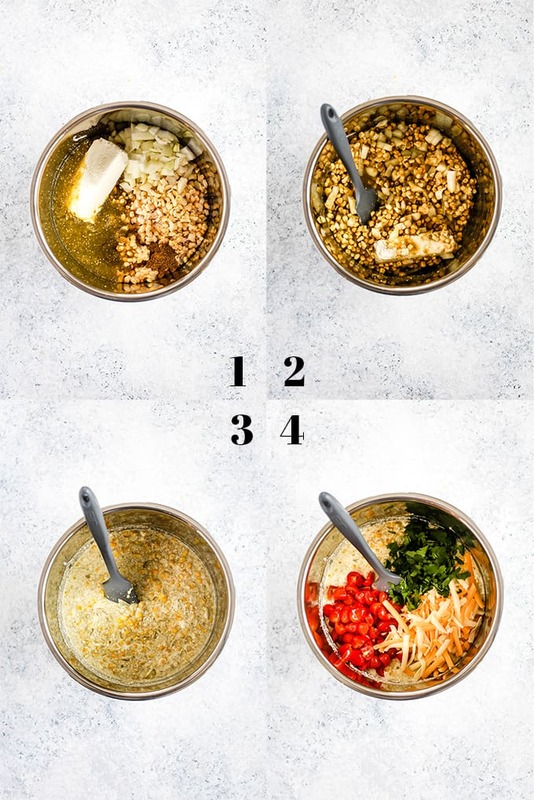 Who knew just nine ingredients stirred together could taste so good? I’ve taken this Slow Cooker Salsa Verde Corn Dip to several get togethers and it’s always gotten rave reviews. It’ll be our secret that it took just minutes to add everything to the slow cooker to be party ready! TIP: Don’t hesitate to double – or triple! – this recipe to feed a crowd. If you do, both options will easily fit in a six quart or larger slow cooker. 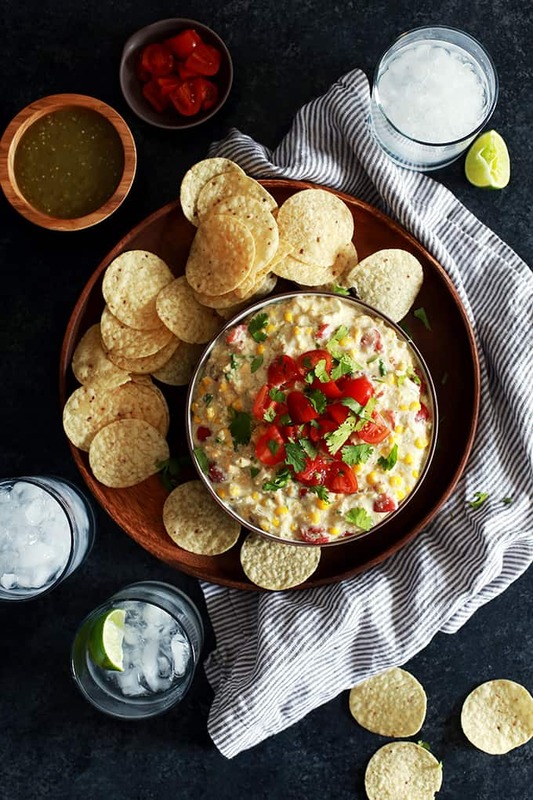 This warm, creamy dip is perfectly paired with tortilla chips but if you’re looking for a healthier alternative, your favorite veggies would work just as well. Carrots, celery and even snap peas are all great choices as a vehicle for dip delivery to your eagerly awaiting mouth! If you’re looking for additional easy dip recipes to round out your appetizer spread, look no further! My two ingredient Pesto Yogurt Dip is perfect alongside fresh vegetables. My Yogurt Dill Vegetable Dip is a non-negotiable at our house and is always at the ready. And of course, then there’s my Creamy Baked Double Cheese and Spinach Dip which is the true definition of comfort food served on a tortilla chip! Spray insert of slow cooker with nonstick spray. Add salsa verde, corn, onion, garlic, cumin and cream cheese. Add Monterey Jack cheese, tomato and cilantro. TIP: Be sure to refrigerate any leftovers. 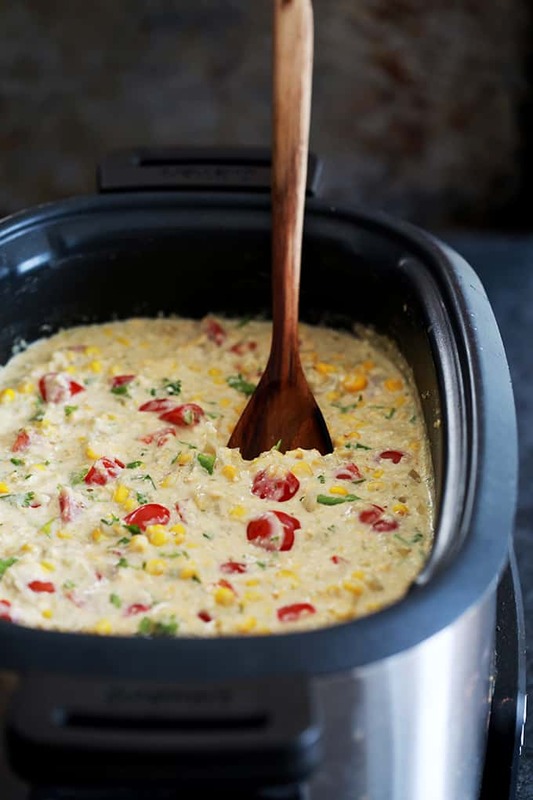 This easy corn dip reheats well in either the slow cooker or microwave. 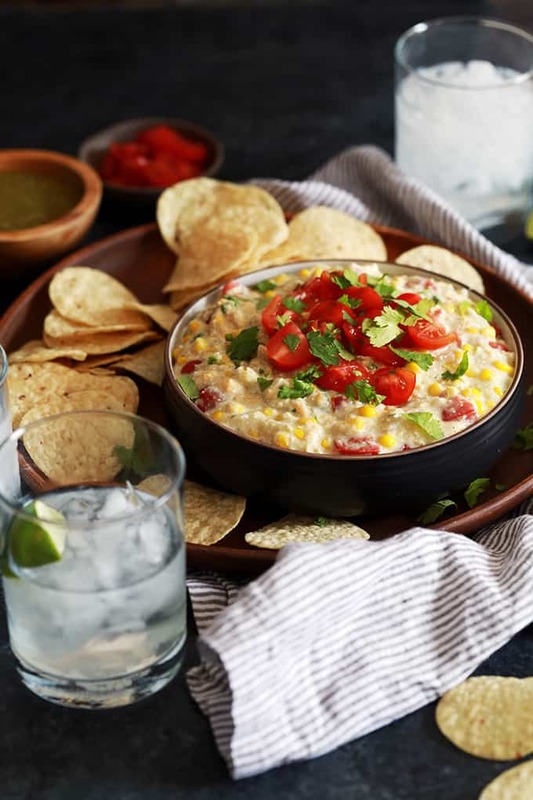 If you’ve tried this Slow Cooker Salsa Verde Corn Dip or any other recipe on Melanie Makes, please let me know your thoughts in the comments below. I love hearing from you and respond to each and every comment! This Slow Cooker Salsa Verde Corn Dip Cream is quite possibly the easiest appetizer ever created. Cream cheese, salsa verde, onion and spices are melted together before being studded with additional cheese, tomatoes and cilantro. There’s a reason why this dip disappears so quickly! Spray crock of slow cooker with nonstick spray. Add salsa verde, corn, onion, garlic, cumin and cream cheese to slow cooker and stir to combine. Add Monterey Jack cheese, tomato and cilantro and stir to combine. Garnish with additional tomato and cilantro, if desired. Although this Slow Cooker Salsa Verde Dip calls for store bough salsa, I have no doubt it would be absolutely amazing using this Tomatillo Salsa Verde Recipe instead. And for all of you salsa verde fans, you could easily create a themed meal with this dip alongside these easy Salsa Verde Chicken Tacos and this out of this world Salsa Verde Mac and Cheese. I had this dip last week at a Christmas party and I stuffed my self on it, so amazing! I have a questions, could you add taco seasoned beef to this as well to make it heartier for more of a meal? I could make meals out of dips easily lol. Thanks for sharing this! I'm a dip fiend myself, Lynn! I think you could totally add the beef you mentioned or even taco seasoned shredded chicken to make a complete meal. So glad you enjoyed it! Thanks for the reply! I was debating on mixing the taco meat into the dip or making the beef then laying it into a taco shell and topping the beef with this dip. Wow is one of the best recipes that I've ever seen! This Slow Cooker Salsa Verde Corn Dip Cream looks super easy and full of ingredients my family loves. Looking forward to trying soon. You're so sweet, Chrissie - hope you'll give it a try! This is going to come in handy this football season! I love it for an easy holiday app, too! Perfect for game days! I love that this is simply made in the slow cooker. It does make it so easy! Hi, Sheryle - I haven't made it in advance because it's just so easy to add everything to the slow cooker and let it do all the work! Cannot wait to try this out for our next gathering! Perfect for any get together, Jessica! My Hubby and I love dips like this! Perfect for a movie night! Absolutely, Anna - I like how you roll! Now that's a dip I could easily devour all by myself! It certainly is addictive, Kimberly! Oh goodness...I want this all year round! Looks so delicious!! 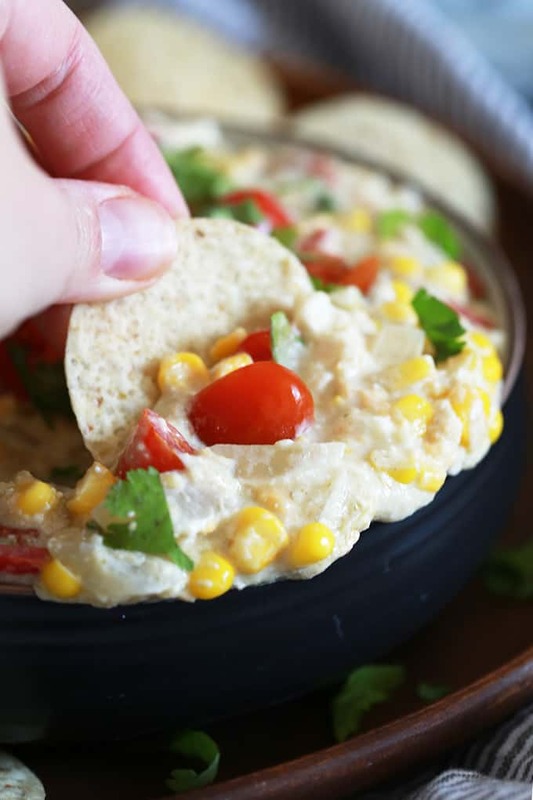 I love how easy is this salsa verde corn dip! Love it! I know my family would eat this up!! I bet they would, Lauren - it's a hit with all six of us! This looks aaabsolutely delish. And I love that it's so simple! What in the world would we do without slow cookers!? I often wonder the same thing, Karly! I could honestly make a meal out of this- it looks fantastic!! Love the fact that it's slow cooker too! You and me both, Jen! I know it's the middle of summer, but this has me dreaming of warm, hearty fall foods! Can't wait to try it! 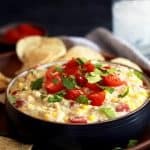 This is definitely a summer friendly dip as well as it doesn't heat up the kitchen and you can totally put to use some of that fresh corn that's everywhere! Oh yum! 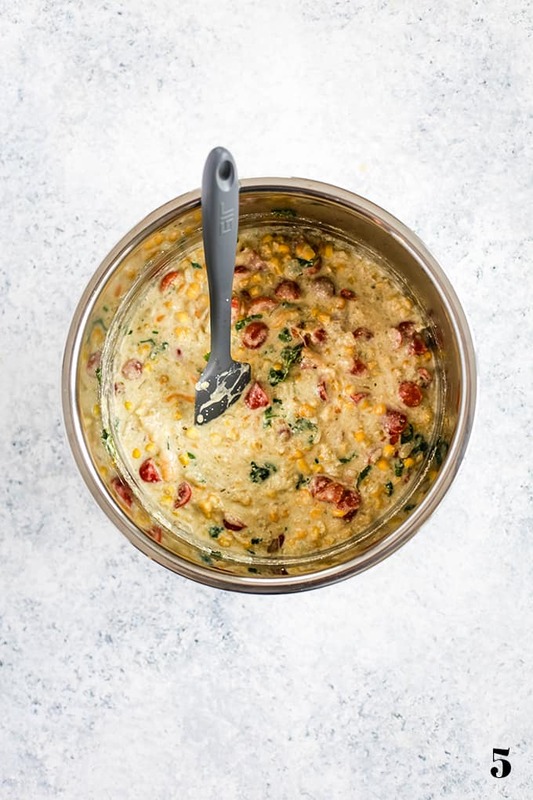 You've taken corn dip to a whole new level with this recipe! Thanks, J - it's also awesome on top of chili! 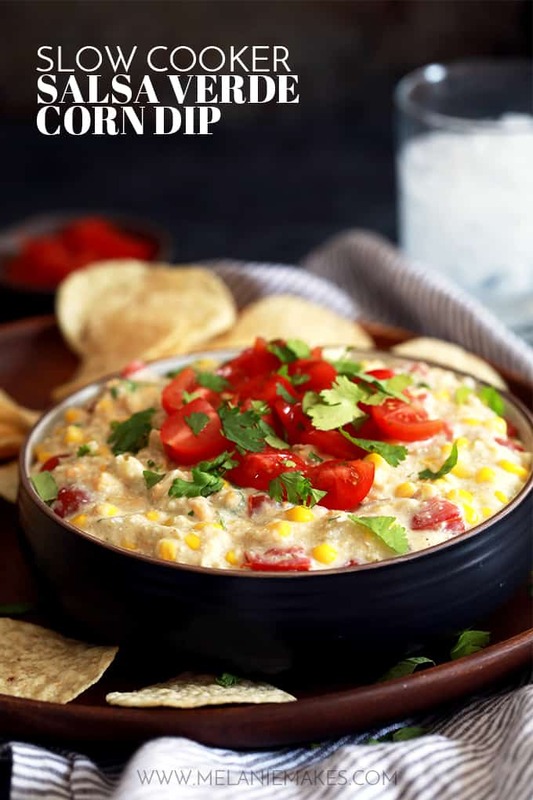 I just bought a slow cooker, so I am definitely trying this dip soon! It sounds amazing, and I love how easy it is! Thanks, Cate - yes, you definitely need to give this dip a try! Whoa! Mind blown! This looks fab. Thanks, Becky - perfect tailgate dip or for watching our Tigers play. This is great for the upcoming, seasonal fun! I love that it's super easy to make, too! I want to dig in! I'd be in trouble around this. Warm dips are my weakness. Looks amazing. Pinned! It is definitely hard to stay away from, Julie! Ooh I could probably eat this in one sitting! This looks like pure comfort food! Thanks, Michelle - I'm with you in that it's hard to just have a small portion of this dip! Melanie! This looks UNREAL! This just got added to our Thanksgiving menu...if I can even wait that long! This is something my whole family would just DIG into :) Pinned! Can't wait to hear how you like this, Trish! I am SO into my slow cooker lately - and this dip is perfect for the busy holiday season ahead! Absolutely, Heather! Minutes to prep and it practically makes itself! I made this on Friday for a appy potluck party (since it was a great excuse to try it out). It was a huge hit. Thanks for the recipe. 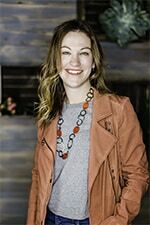 Hey, Erin - So glad everyone enjoyed it! Happy New Year!